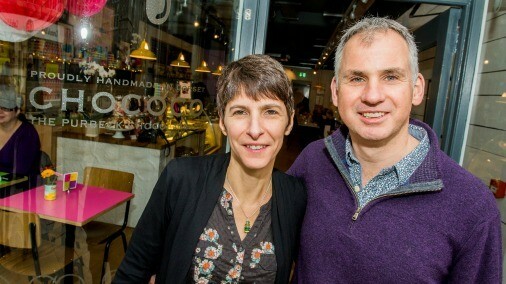 Claire Burnet was kind enough to take time away from her kitchen to answer my questions about her wonderful chocolate business. 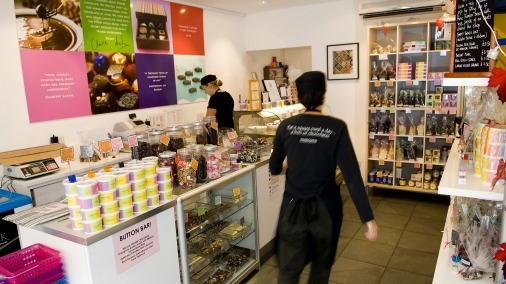 We set up Chococo in 2002 driven by my love of fine chocolate (inspired by my parents living on the Continent in the 1980s and 90s) and I realised that there wasn’t really anyone in the UK making truly fresh handmade chocolates with origin chocolate, fresh cream ganaches and local ingredients with no additives or preservatives. 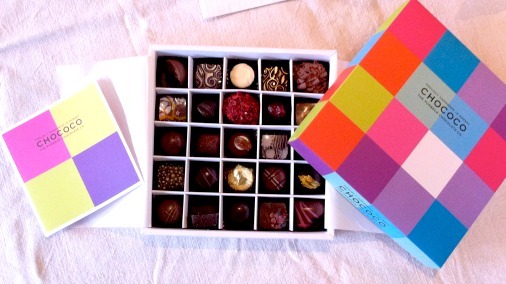 A box of Chococo’s delicious fresh chocolates in their trademark colourful packaging. By hand! When we first started, we made all our ganaches with local fresh Dorset cream from Craig’s Farm dairy near Weymouth. 11 years later, we still work with Trevor’s cream (he delivers it to us direct to our chocolate kitchen every few days), but we also now make a much wider range of ganaches with other liquids including wine, beer and even coconut milk. We make the ganaches every morning and then when they have cooled, pipe them into moulds (which we will have made ahead as we don’t buy in any shells) or into truffle balls ready for dipping later or cut into squares for enrobing. 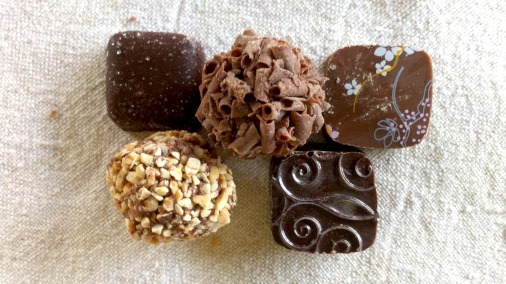 We still hand pipe, dip and roll all our truffles, so they are all slightly different shapes as a truffle should be! Chococo chocolates up close and personal. When our moulded chocolates are finished, we then decorate them by hand to give them all a unique identity – these decorations vary from edible patterns to edible shimmers, hand-piped chocolate swirls or stripes or other edible treats stuck to the top of the chocolate with chocolate glue! In between making all of our individual chocolates, we squeeze in making bars, lollies, clusters and any seasonal gifts such as Easter eggs. As we make in season, we are up to our eyeballs in Easter eggs, hens and new giant bunnies at the moment! 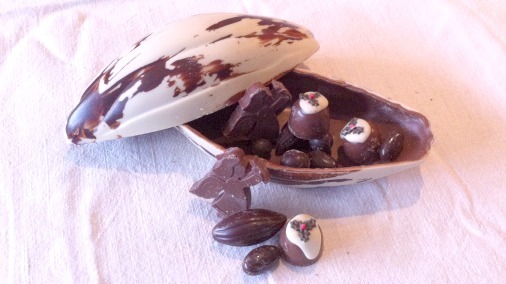 Christmas always sees exceptional creativity and taste, such as this filled chocolate pod. You often add new seasonal recipes, do you enjoy cooking up new flavours and ideas? We have always been seasonal in our approach & it’s one of the best things about working with fine chocolate. As well as our annual seasonal specials, e.g. Christmas Pudding and Mulled Wine chocolates at Christmas or Hot Cross Buns for Easter, we create a seasonal chocolate of the month and have huge fun creating these flavours. Last year we brought out chocolates with fabulous flavours all sourced from local Dorset food producers including fresh blueberries, Blue Vinny cheese, Black Cow vodka & even locally grown kumquats! So far, this year we are experimenting with a sparkling wine from English Oak Vineyard based near us in Wareham and black garlic from the South West Garlic Farm, based near Bridport in West Dorset. 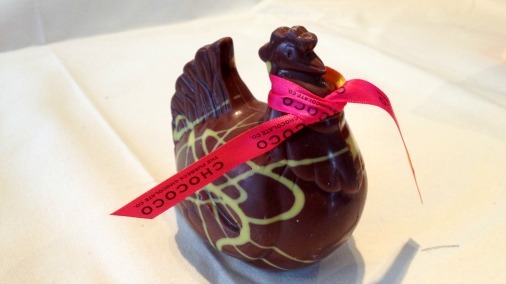 A beautiful hen from Chococo’s Easter offering. You are also very strong on seasonal shapes and gifts, with really stunning and quirky designs. How do they come about? Lots of brainstorms with all the team! Our office is covered in brain maps and stimulus including very importantly, customer feedback. Starting your own artisan business must have been a steep learning curve. You have to dig deep as you can never take your foot off the pedal. The business has evolved and grown but it still demands as much of our energy and time but in different ways so Andy (my husband) and I are still working as hard now as we did when we first set up the business. Making a product by hand means people – people to make, pack, despatch, sell and support. We now employ over 30 people and that is intense! We have also learnt that you need space to both make and pack chocolates. We have outgrown two chocolate kitchens over the years and now make all our chocolates in a unit in Wareham, a few miles up the road, as we just ran out of space in Swanage. The kitchen in Swanage is now the bakery for our cafes and we run chocolate workshops and parties there. 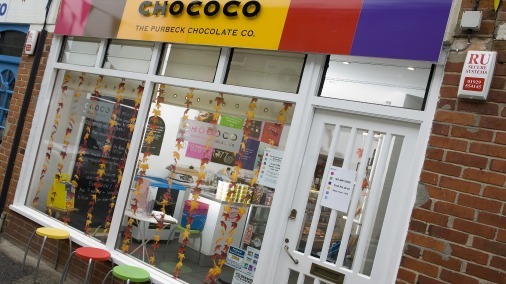 The exterior of Chococo’s Swanage Shop. Tell me a little about your place in Dorset, where Chococo is based. We set up Chococo in Swanage on Dorset’s Jurassic Coast. It is in the south east corner of the county in an area known as the Isle of Purbeck and is a beautiful area with beaches, cliffs, ancient villages and castles (Corfe Castle is just five miles away) and a lot of brilliant food producers! Andy’s family was from Swanage and we got married here in 1999, so we have a strong attachment to this part of the world that to date, is relatively less known than areas in say Devon or Cornwall. We are very proud to be a Dorset food producer working with as many locally sourced ingredients as possible. We love combining our fine origin chocolate with their produce to create very special chocolates that have a unique identity and flavour! The interior of the Swanage shop. Yes, things are changing but there is still a long way to go to educate consumers and even teach customers about the difference between “industrial” commercial chocolate and fine chocolate. The corresponding difference in sugar levels, purity and cost to produce. I still find many buyers of even premium retailers are not fully aware of the differences and the cost implications. 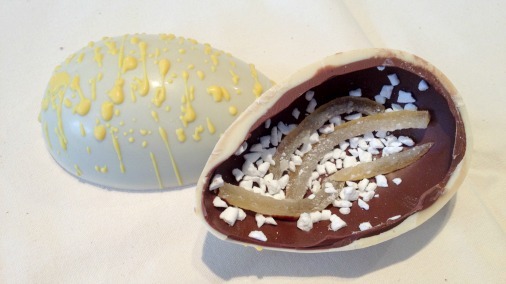 The lemon meringue egg reveals its delicious interior. I would hope that there will continue to be growing awareness amongst consumers of the difference between fine and industrial chocolate. Most importantly in the taste differences between truly fresh products made without additives or preservatives and ones filled with preservatives such as glucose syrup and alcohols. There is also a lot of interest in bean to bar production at the moment but for me, whilst it is exciting to show consumers the process of making bars from scratch, I feel it is important to support the companies in cocoa producing countries who are producing finished couverture and retail bars in their own countries. They are contributing so much more to their local economies than just exporting raw cocoa beans for us to add all the value. It is no doubt a debate that will go on for a long time. Chocolate aside have you always been a foodie? Yes! I blame it all on my mother – she was feeding me risotto, blinis and polenta as a child before anyone had ever heard of them. She is an excellent cook and we used to cook together when I was a child, especially at Christmas making lots of chocolates! I started a recipe book before I went to university with all her key recipes and it is still my go to book. She definitely inspired in me a love of flavours and experimentation. If anything, I have less of a sweet tooth! That sounds like an odd thing to say about someone who works with chocolate every day, but boy do I notice something that is packed full of sugar. I am a chocoholic, not a sugarholic and I am constantly shocked at how much sugar is in other chocolates, cakes etc that is so unnecessary. 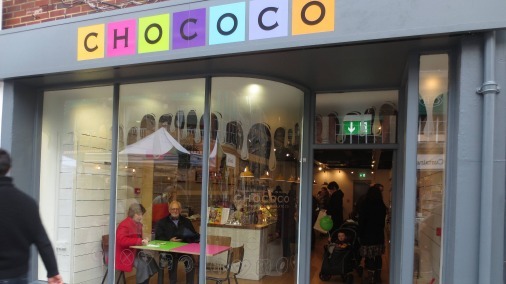 The new shop in Winchester is a magnet for chocolate lovers and a wonderful achievement for Chococo. Congratulations on your new shop in Winchester, it is great to see that you are going from strength to strength. Tell me how did that come about. We have wanted to open a second shop for a while and the opportunity came up last year. It took a long time to get sorted out but we are thrilled to be finally there. Winchester is a great location for us being only an hour from Wareham and we have since discovered that lots of Winchester folk have connections with our part of Dorset, so we have had a wonderfully warm welcome! 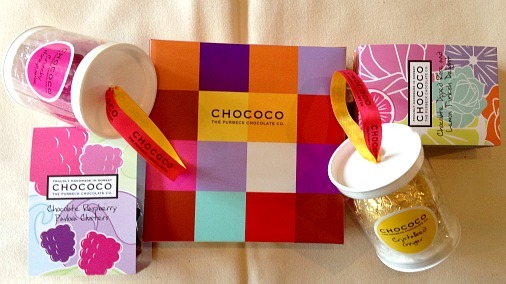 Chococo has a strong, happy and well-loved brand identity. What is coming next for Chococo? What plans do you have for the chocolate and for your business? Our website needs a bit of a refresh so that is our next project, along with continuing to play with new seasonal chocolate ideas. We are also already thinking about ideas for our Easter 2015 range as some of our trade customers want to see concepts by May!